Internet, today I am going to post some pictures and give you some relevant facts/less-actually-relevant-facts about them, and you are going to tell me what to think and do about them. That’s just how this post has to go, because I am really at a loss here. Last night, my husband went outside to fire up the grill because we wanted to take FULL advantage of this balmy spring interlude before the snow starts falling upon us in great bulldozersfull. He came back in, rather perplexed. 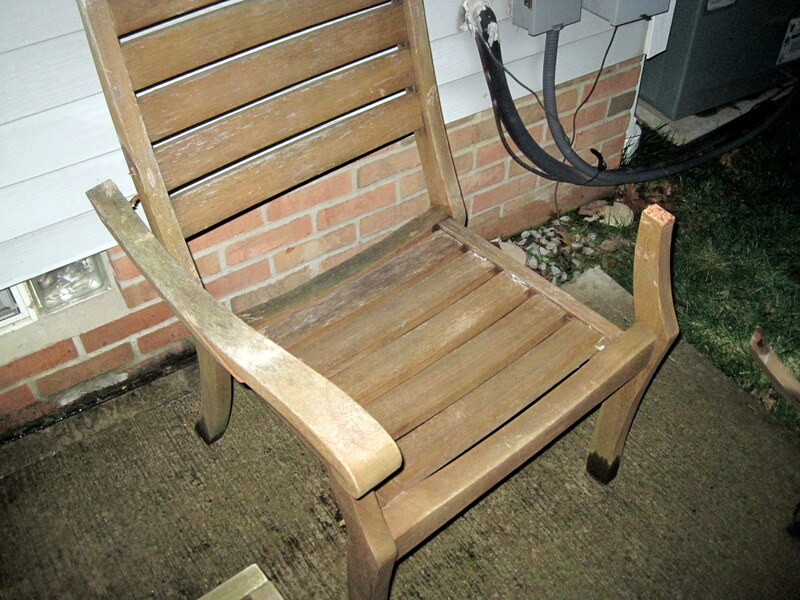 “Some of our lawn furniture is broken,” he told me. My in laws had given us a huge set of lovely Crate and Barrel lawn furniture when we moved here – second hand lawn furniture, but still. We never would have shelled out the money to buy it, so we were grateful and pleased. There are six chairs (meant to go around a table that we do not have) and an adjustable lounge chair and a loveseat and two side tables. My husband and I – knowing nothing about the proper care and handling of lawn furniture, nor having any extra storage space indoors, nor wanting to shell out the may-I-say EXORBITANT fee Crate and Barrel was asking for covers – kind of just took the view that the furniture lives outside and will last as long as it lasts and that’s the end of it. So the furniture – even though it is teak and probably requires weekend coddling and monthly trips to the spa – lives outside year round. I have somehow detoured down a guilt side alley here. ANYWAY, four of the chairs, the two side tables, and the loveseat live on our deck. The remaining two chairs and the lounge chair live with the grill on the concrete patio adjacent to the deck. The broken chairs my husband was referring to were the concrete patio dwellers. They had been moved up against the house to protect them from the crazy winds we’d been having in Decemberish. This is what they looked like when he found them last night. This is both chairs. The far chair is under the laundry room window. The near chair is under nothing. Ignore the lounge chair, which is draped in the grill cover. 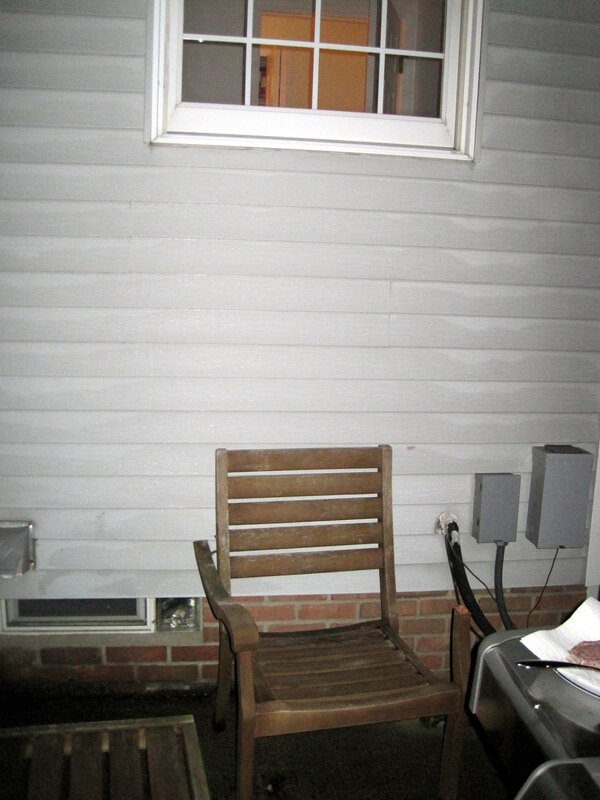 Here, you can see the broken chair and its proximity to the window. The right arm is broken completely off. The left arm is split in two. Here’s the chair that’s under nothing. It too is missing one arm and has severe damage to the other. But… it’s not under anything… so why would anyone be climbing on it? I can’t see a burglar breaking one chair and then swapping it with the other… These chairs aren’t LIGHT – they’re rather heavy. Okay, now here is where is make your first impressions, Internet. But please: hold off on running to the comments to tell me I must move immediately lest I be slaughtered in my bed. First, I would like to tell you the related relevant facts and less-actually-relevant-facts, to help you come to a more informed conclusion. 1. The chairs et al reside in our backyard. The yard is fenced on one side. The house is opposite the fence, and bracketed on either side by white gates of the Home Depot variety. The other two sides of the yard are hemmed in by arbor vitae – tall, thin bush-trees that make their own fence-like boundary between us and the neighbors. So the yard isn’t impenetrable, but it looks, to the outsider, like it wouldn’t be EASY to penetrate. 2. We recently had some Major Snow – at least 10 inches, if not a full foot. Snow is heavy. (But… it’s not that heavy, is it?) And water and ice can be very destructive. 3. None of the other chairs had damage. 5. 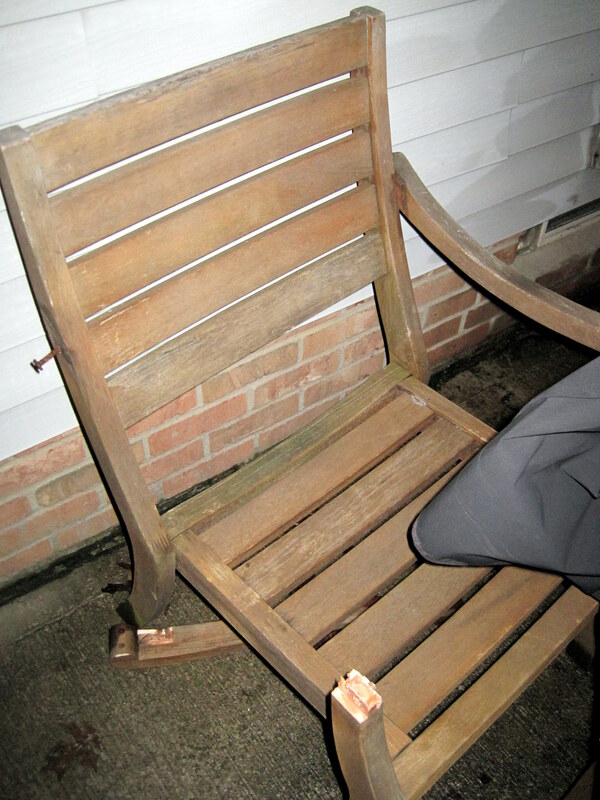 But the other broken chair was situated beneath nothing. 6. Our neighborhood is typically pretty safe. But I did spend some time going through our local police blotter last night, and there was a cryptic and not particularly helpful entry about a break-in on a street that’s just a mile away from us… And another entry about a burglary just a few miles from us wherein the homeowner had left the door unlocked for her sister that day, so the sister could feed the homeowner’s cats. Both incidents happened recently – the first in the past week. 7. Just this past week, I was upstairs getting ready for work when I heard a loudish crash. In my head, I thought, “That must be the watering can on the deck railing – it must have fallen over onto the concrete six-odd feet below.” (I don’t know how one ignores a watering can until it has filled with water/snow and been ice-fused to the deck railing, but that is what happened.) But when I looked out the window, the watering can was still there. My brain rationalized this new information by thinking that some of the snow must have melted enough to slide off the roof in a great loud pile. But I didn’t really go looking for the source of the noise. 8. I have had several mornings in the past few weeks where I’ve heard sounds that I brushed off as typical house-creaking, neighborhood normalcy… But then my mind would start going through scenarios in which a burglar/murderer broke in and I would have to… deal with that. 9. I read an article last year about two women who were brutally attacked and one of them flung herself out of a second-story window – naked, for a reason you don’t want to know – to get away, and the other one didn’t survive, and that article has been on my mind a lot recently. I’ve been going over in my head how I would react, and I’ve been trying to steel myself up to re-read Swistle’s post on how to deal with a home invader type (haven’t reached optimum steel yet), and I’ve been running through horrible scenarios in my head on a loop. 11. If someone were to be watching my husband and me (shudder), he would very easily know when one or the other of us was in the house, and when we were both gone. I keep thinking that it is really pretty unfortunate that my husband and I have such an established routine. But when you have a job that starts at a certain time each morning, it’s kind of difficult to switch things up, you know? Okay. That’s all I have for you, Internet. I mean, it looks like someone stood on that lawn chair to get up to the laundry room window, right? And that the weight of that person – a burly, well-muscled man with insidious intent, I’m assuming – ended up breaking the arms of the chair. What else could cause that kind of damage? My husband, ever the optimist, suggested that perhaps an animal chewed on the chair… or stood on it… But I just don’t think that’s realistic. 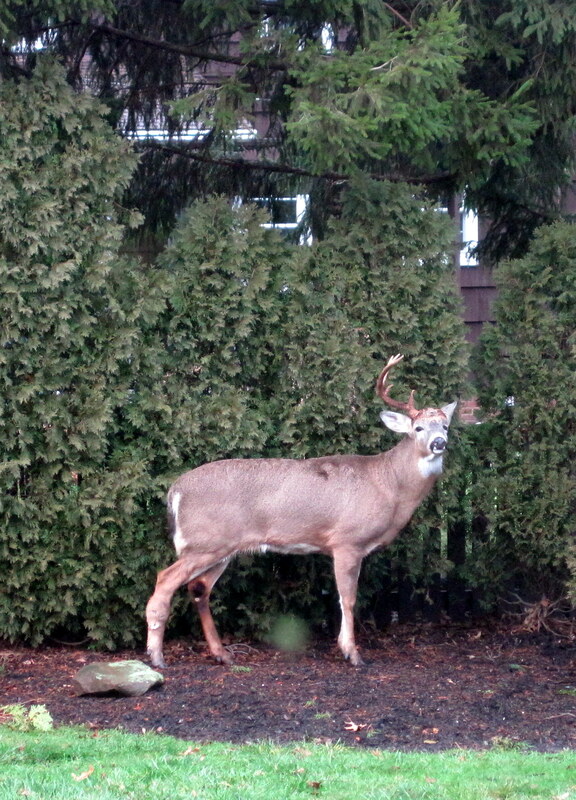 Yes, he only has one antler but that doesn’t necessarily mean he’s a criminal. But I can’t see him wanting anything to do with two lawn chairs. 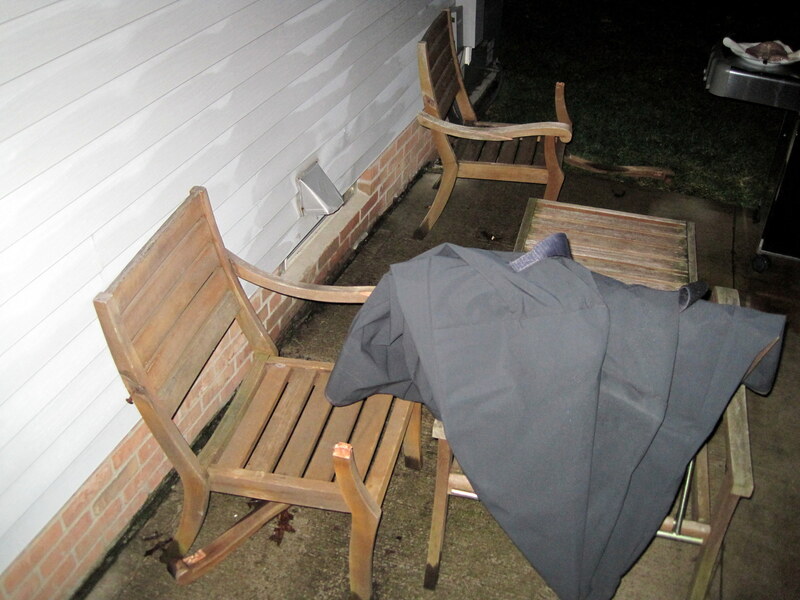 And if snow or wind were to blame… Well, then why were only those two chairs affected, and the other four chairs – plus loveseat, plus tables, plus lounge chair – left undisturbed? So of course I am now driven to new heights of paranoia. I keep thinking back to the random home invasion dreams and murderer-break-in thoughts I’ve been having… And wondering if that’s my brain understanding something on a deeper level that my conscious mind is not sophisticated enough to process. That maybe I should be paying rapt attention to these thoughts, because they could be indications that something is seriously wrong. And it’s not like I don’t already have a murderer-thoughts proclivity. But then again, again, what could have broken those chairs? I mean, obviously, I am now sitting in my house in the broad daylight with the alarm on. So there’s that. But do I… call the police? It seems like such a time waster. Especially because we have no idea when the chairs got broken. Especially because any evidence (“evidence”) has surely been tainted by snow and rain and thaw. I guess I could mention my concerns and see if they would increase their patrols through our neighborhood? I don’t know. My experience with the police is limited to Drug Abuse Resistance Education in middle school, that time I backed into the police chief’s daughter’s car in the high school parking lot (I maintain that we backed into each other), and a long history of watching Law & Order and CSI and the like. Oh. And that time I burnt the popcorn, which was more like a near encounter. We DID move the chairs away from the house, though. No point in just straight out inviting someone to climb through your window, am I right? Some short thoughts for you today, Internet. I know, brevity is unusual for me. Don’t worry – I made up for it in quantity. A cardinal’s call sounds like a gun in a really girly video game. I have heard that acupuncture is really good for anxiety, but I get anxious just THINKING about acupuncture. The worst thing about Fourth of July is the surrounding 4-to-6 week period of random fire-crackering at all hours of the day and night. I do not enjoy playing the game of Fire Cracker or Gun Shot? with my husband when we’re snapped out of sleep at two in the morning, fearing for our lives. The best – inexpensive – red wine I’ve had in a long while is the 2010 Michael David Petite Petit Sirah. You’re welcome. Sometimes I like to sit in my backyard in my bikini (and shorts) and catch the rays. The neighbor whose backyard touches ours has a 22-year-old daughter, home from college, who also likes to sunbathe in her bikini. So my flabby abs and I stay inside a lot. Trader Joe’s microwavable jasmine/basmati rice has changed my life. I miss Jill Zarin. And that crazypants Kelly. I do not miss Simon. Come to think of it, I miss Paris Geller too. There is nothing more exciting than growing actual fruit on actual plants that you actually planted. There is nothing more frustrating than trying to protect them from the neighborhood wildlife. This is not your personal produce section, DEER/CHIPMUNKS/SQUIRRELS/BUNNIES/BIRDS. What kind of creature is leaving giant poops in my yard? Standing with the fridge door open, looking at a cold can of delicious Diet Coke, imagining that crisp, bubbly elixir of happiness trickling down my throat, and contemplating a night of staring at my ceiling fan while my heart whirs frantically and my brain cycles endlessly through my to-do list is not fun. There is no good option here, folks. The other day, I saw two cars with personalized license plates. One said One Soul and the other said Fun Knee. What? Why is “exercise more frequently” the solution for so many things and “nachos with a brownie chaser” is the solution for nothing? I never thought I’d see this day, but alas: we have run out of bay leaves. Tom Selleck as Richard from Friends. Indiana Jones-era Harrison Ford. Bruce Willis any day, any time. I probably go outside in my pajamas more often than I should. My couch loses approximately ten zagillion feathers each day. I’m pretty sure the feather supply is infinite, but if it turns out I’m wrong, what do I do? Just… throw out the couch? Which will at that point, obviously, be just a pile of empty fabric rectangles. I’m not boycotting them or anything, but I haven’t had an Oreo in about two years. I could really go for an Oreo right now. The only book I’ve read – all the way through – since March is 50 Shades of Grey. Make of that what you will. What are you thinking about today, Internet? I have missed you and I have missed blogging and I have a whole HEAP of blog posts for your reading pleasure. (Or your eye-rolling pleasure, I’m cool with it either way.) Of course, I have to WRITE the posts, but I am going to TRY. Anyway, I would like to fill you in on the drama that I’ve been experiencing over the past few months. Drama that has caused me great angst. Drama that culminated, yesterday, in an act of vengeance so vindictive, so strategic, so MEAN that I am still upset. But, because I am a fair person, I want to give you the background before I reveal how horribly I was wronged. That way, you can judge for yourself if the retaliation I endured was merited. A couple of months ago, my husband and I went to The Home Depot. It’s our favorite store. And it was spring, and I was in the mood to Grow Things. So I bought lots of things: pots, baby tomatoes and bell peppers and strawberries and a variety of herbs (none of which survived – NONE). I also bought a bunch of seed packets and some of those seed-starter things. And soil – copious amounts of soil. Some insecticidal soap. Some garden implements and garden gloves. Stuff to make the soil hold water. Stuff to make the plants grow better. A SPRINKLER. All sorts of goodies. 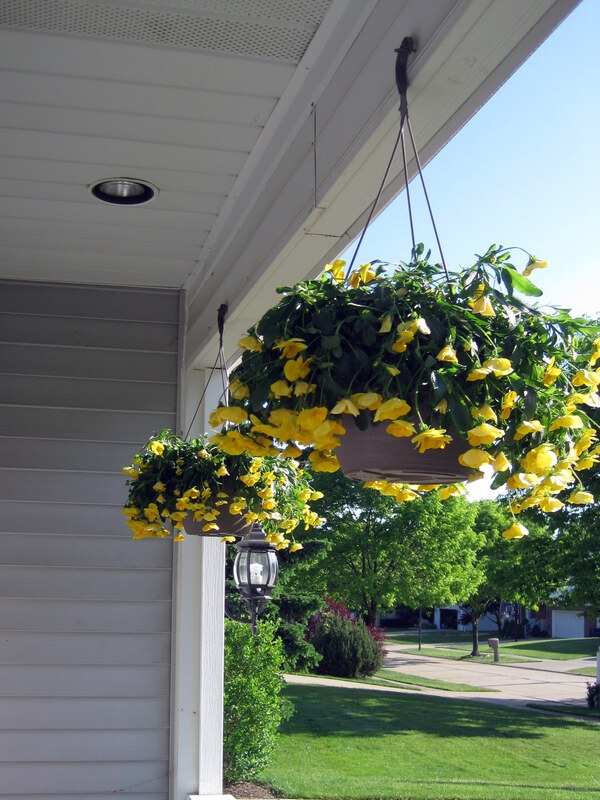 We also bought two hanging baskets of lovely yellow pansies. 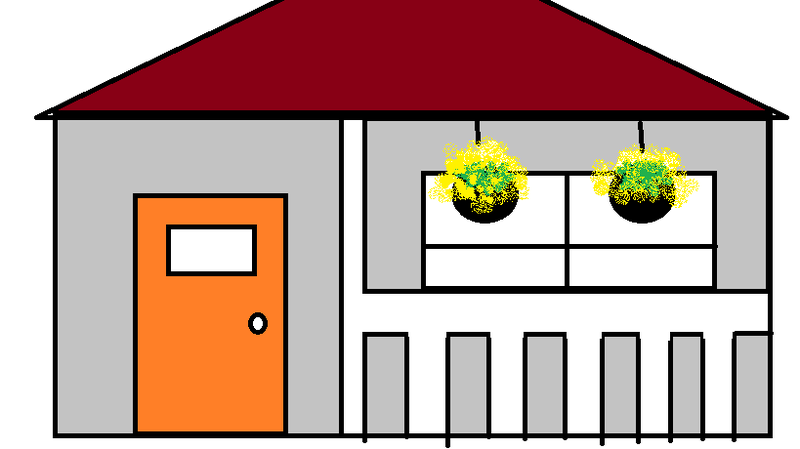 I don’t seem to have a photo of our house with the pansies, so I have included a highly accurate artist’s rendering below. I feel compelled to admit to you that this drawing is a lie. Our front door is not orange. It’s black. And it has a white screen door between it and the outside. It’s ugly, is what I’m saying. And I so very much want to have a bright, happy door. Also, I don’t know why the roof is red. That’s ridiculous. My roof is… black? Brown? Brack? As though, all together, each pansy had decided to leap from the side of the basket. And, being tethered to the basket by their roots, they remained frozen, mid leap. What would prompt them to jump ship? Perhaps they simply needed water, I thought. So I pulled them from their hooks. And what should I find inside…? Yes, Internet. That is a NEST. 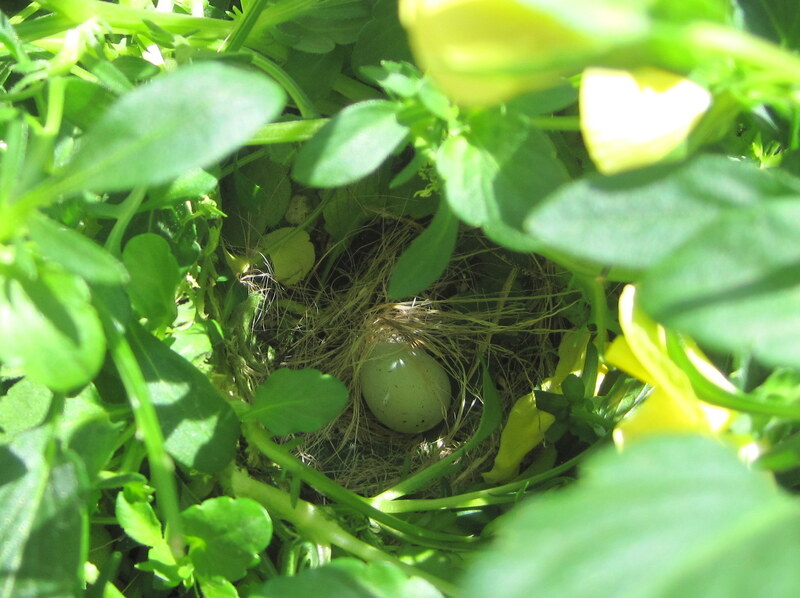 A BIRD had made a NEST inside my pansies! Admittedly, it was kind of adorable. But Internet. I cannot have birds just making themselves at home inside my FLOWER POTS. After all, I spent money on those flowers. And I am not going to WATER A BIRD’S NEST while trying to keep the flowers alive, you know? So I carefully pulled the bird’s nest out of the flower pot and threw it away. It was so delicate, Internet. Lovingly embroidered with hair (uuuuuuhhhhhhhh hair *shudder*) and grass and a piece of soft brown yarn. 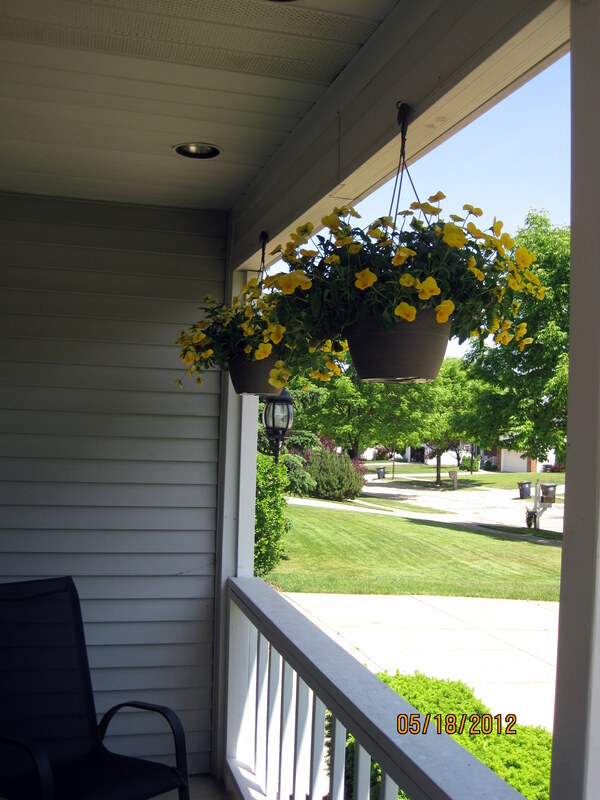 I watered the pansies, restoring them to their cheerful glory, and figured that was the end of it. Certainly, even a bird stupid enough to build a nest inside a flower pot wouldn’t build ANOTHER nest in that same pot, right? 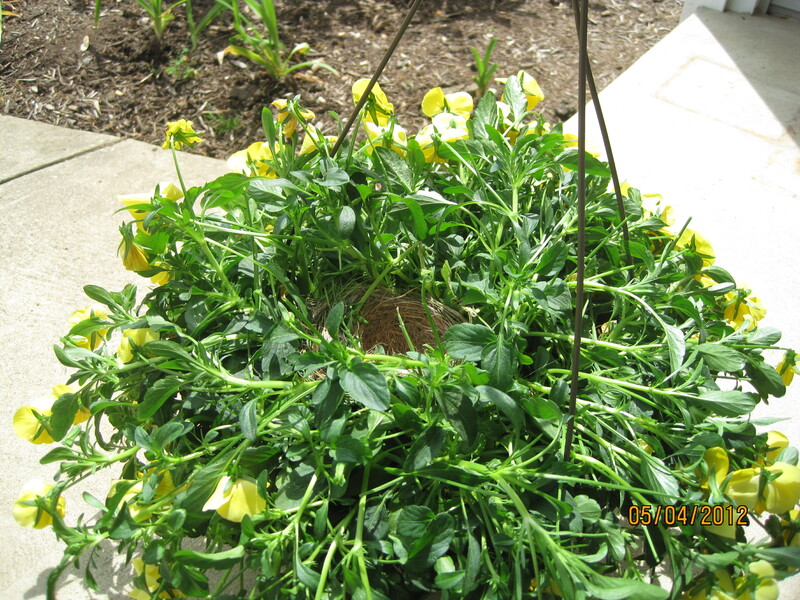 I mean, clearly the flower pot is inhospitable to nests! But to be on the safe side, I hung the bird’s nest basket on a different hook. The next day, I hurried outside to check on my pansies. Two sparrows flew away from my front porch in a very suspicious manner. They landed in the big maple tree in my front yard and looked at me worriedly. There was ANOTHER NEST in the flower pot. The same flower pot from which I’d pulled their original nest. The flower pot that was now on the right-hand hook instead of the left-hand hook. 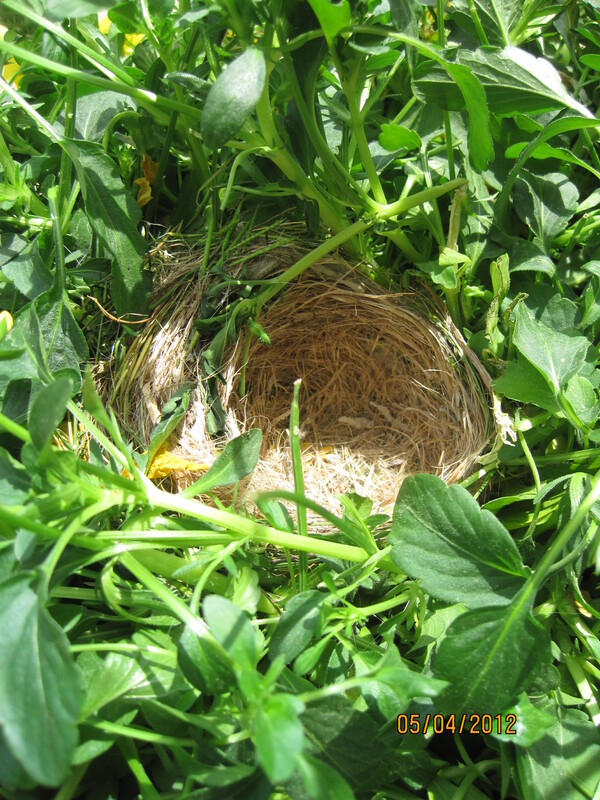 I removed the nest, watered the flowers, and went inside. The sparrows chirped at me from the maple. The next day, I set my jaw and headed outside. Again, the panicked – and ominous – flap of sparrow wings. I yanked down the pansy basket and looked inside. These idiots had left their OFFSPRING in the same spot where TWO PREVIOUS NESTS had been demolished! I am a cold and heartless and horrible person. So I gently lifted the little egg from the flower pot and put it in my garbage can. I felt TERRIBLE about it, believe me! But Internet! Birds are messy and destructive and I didn’t want to watch two sparrows raise a family in a flower pot that would have grown increasingly DEAD. That night, I went to The Home Depot and bought some green plastic stakes that you use to anchor mesh into the ground around your strawberry plants (foreshadowing!). They were about three inches long and one end was pointy – but not DANGEROUS – and the other end was a flat circle. My plan was to put the stakes in the flower pots, so that the pointy end pointed up, making it uncomfortable (but again, NOT DANGEROUS) for the birds to land and/or nest in the flower pots. And there was ANOTHER EGG. 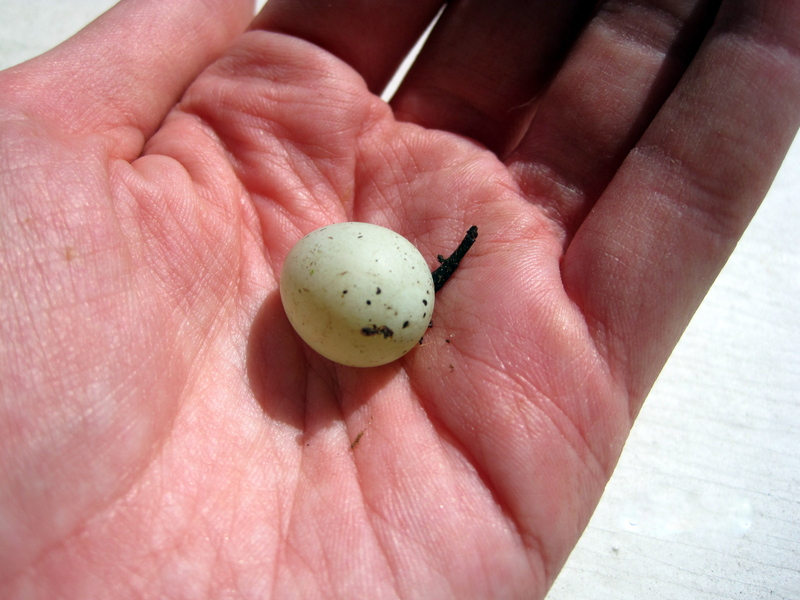 Poor birds were so desperate to get the egg part out of the way, they stopped even caring about the nest. Which, if you think about it, makes them pretty unfit parents, right? I mean, what kind of parents build a home in a place that can be easily destroyed… And then, after it’s destroyed, build another home in THE EXACT SAME LOCATION… And then have babies there… And then when their baby DISAPPEARS, along with their THIRD HOME, they just have another one? Anyway, that was it. I installed the plastic stakes, which seemed to do the trick. No more nests. No more eggs. The sparrows hung out on the front side of our house for a while. I was afraid they would dive bomb me… using any means necessary, if you know what I mean. But they kept their distance. Eventually, they moved around the back of house. There’s a sliding door from our kitchen to our porch, and the door has an electric awning above it. The sparrows built a nest in the awning mechanism. But they just built a new one. My husband and I resigned ourselves to the mess below the nest – feathers, sticks, grass, and bird goo – and the NOISE (scratching, feather ruffling, constant, un-ending chirping), and, of course, the hysterical frenzy of flapping whenever we dared to set foot onto our porch. But we felt that we’d reached some sort of equilibrium with the sparrows. That we didn’t necessarily like each other, but we were willing to share the world for a time. But the cease fire didn’t last, Internet. Oh no. They were bound and determined to get me where it hurt. But that’s a sad, sad story for another day.